On the court I have been told of the successes of the 16u Outlaws getting to the finals at 17u championship. So close to a spot in the Grand Prix. Also I recieved a message about the tete a tete battle between the Six Shooters and the Revoler in the end the Shooters take the Gold over the Revolvers at the 14u Trillium and the Goldiggers run at the medal round in championship 14u. Then I look at the CIS stage and find Mavericks headlining the results leading into Nationals. We all know of the battle between the Maverick alumni laden Gee Gees ( Myriam and Kelsie English '10, Steph Theiler '10, Alix Durivage '11, Vero Caya'12, Callie Soro and Mezzie Tamarat '13, and the latest sensation Sabrina Roy '14) taking on fellow Alum Charlotte Sider ('10) in the OUA women's final. Both teams will return to the Goldring centre at the U of T this weekend to compete with another Mav alumni, Sophie Carpentier('12) and her Spartans from Trinity Western and Vicki Savard('11) and les Carabin de Montreal. On my own side of pride proclamation and attention will be focussed in Hamilton at this season's OCAA championships where Alana MacLean('10) will try to push her Excalibur teammates from Trent University past the Humber Hawks armed with alumnus Adara Dillabagh('14) and a shot at the CCAa tournament next week. If you noted the number of ('10) girls in this article. I would like to remind them of a promise we made 5 years ago to "stand by me" through thick and thin. Let's all raise a glass to an amazing 5 years and finish in a blaze of glory. 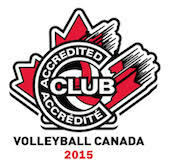 Lastly and by far not the least of my emotion came when I was struck with overwhelming sense of pride in an e-mail recieved from Tammy St Denis with the news that the the club was awarded Volleyball Canada Accredation status for the second season in a row. A measure of the commitment and dedication of all the people who have embraced our family and its desire to provide quality programming for youth.